No Place Like Home is a cute half hour freebie “for the fans!” story written by Iain McLaughlin, Erimem’s creator. It’s mostly an excuse for the Doctor to show Erimem (and us) around the TARDIS. It also provides a few extra paintstrokes to Erimem’s backstory. This was my first exposure to Erimem, and I took to her at once. The guided tour goes awry when the TARDIS (of course) starts to break down. Something’s messing with her internal geometry. But which something? Is it Shayde, an odd artificial construct imported from Doctor Who Magazine comics? Or… something more insidious? Besides Shayde, Erimem’s cat Antranak puts in another cameo, reminding us that Five is very much a dog person. The first time I heard this audio, I lacked the requisite sense of humor and was underwhelmed by the ridiculous antagonist. (If it had turned out to be the Master in a genie costume, I wouldn’t have been entirely shocked. No, don’t worry, it’s not that silly.) This time around, I was amused. There’s something to be said for a light-hearted Five Big Finish story. Besides, Erimem fits in so comfortably that it’s hard to believe that she wasn’t a classic companion all along. It’s a simple production, with minimal sound effects and one guest actor playing both guest characters, but it does have the first instance of the Fifth Doctor’s awesome 80s theme (my favorite) since 1983. Originally a CD insert in Doctor Who Magazine, this audio is now a free download on the BF website. 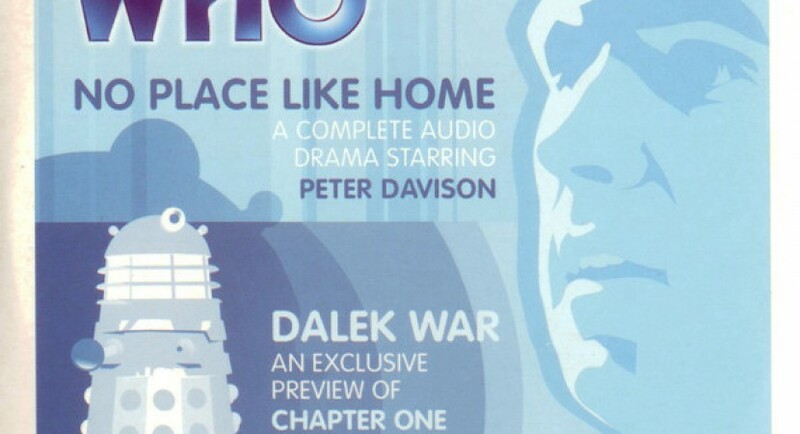 No Place Like Home also previews the first 5 tracks of Dalek Empire II – Dalek War – Chapter I.
P.S. There’s good custom cover art for No Place Like Home on the Spacehopper’s gallery of fan-made CD covers for all the freebies included in old Doctor Who Magazines.